Tamara Nsouli, a student in the chemistry master's program, was able to continue her summer research in Greece thanks to the Dr. H Alan Ewart Memorial Award. One Syracuse native has taken her graduate studies at SUNY Oswego to an international level. Tamara Nsouli, a graduate student in the chemistry program, studied in Athens, Greece, for the summer after earning the Dr. H. Alan Ewart Memorial Award. Nsouli’s research at SUNY Oswego focused on how the Apolipoprotein E, a specific protein that transports fats in the body through the circulatory and lymphatic systems, interacts with lead. ApoE has three different forms, two of which were made and purified by SUNY Oswego collaborators in Greece. Nsouli traveled to the National Center of Scientific Research: Demokritos in Athens to create the third form and bring all three back for more research. Nsouli was able to finance her trip abroad in large part to the chemistry department, who awarded her one of the many scholarships SUNY Oswego offers to its graduate students. Nsouli's research focused on creating and purifying three proteins with SUNY Oswego collaborators in Greece. “[The chemistry professors] all supported me and I’m so grateful for that. My supervisor, Kestutis Bendinskas, is the one who actually came up with the idea and arranged the trip for me. He contacted his collaborators in Greece and asked if they would host me so I could make the third isoform,” Nsouli said. “All the people in my lab were either Ph.D. candidates or [post-doctorate] students, and it was great to work and learn from people with that kind of experience." Nsouli was thrilled to continue her research in Greece, where she earned real-world chemistry experience in a work setting among young professionals. Nsouli did more than extensive research while in Athens; she also had the opportunity to learn more about the city’s lifestyle while she stayed at an apartment her supervisor set up for her. Nsouli’s favorite experience abroad was the chance to learn about a new culture. 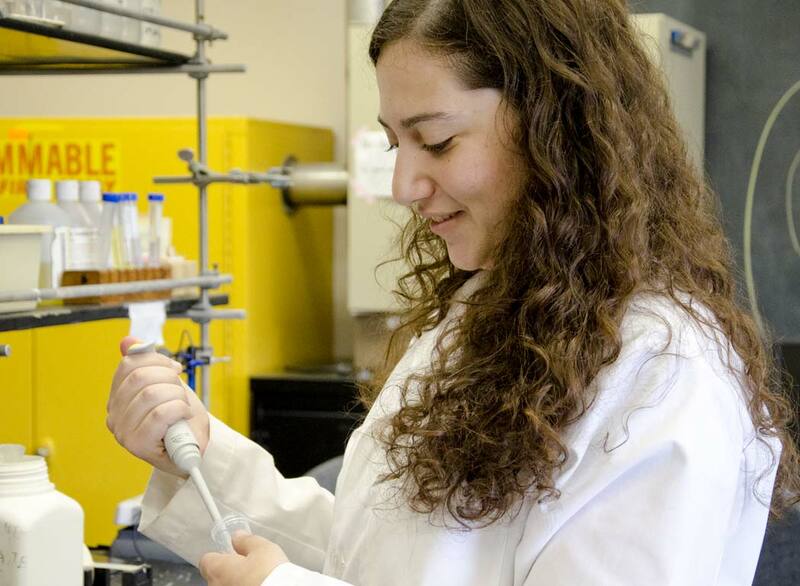 The close-knit Greek culture mirrored Nsouli’s relationships in the chemistry program. Nsouli came to SUNY Oswego after completing her undergraduate degree at McGill University in Montreal. It was the class sizes that attracted her to the graduate chemistry program. Nsouli is currently a teaching assistant in the chemistry program. She found her love of teaching as a graduate student at SUNY Oswego.